Few players in the Nigeria Premier League 2010-2011, if any, can match the scoring record of Jude Aneke, the star striker of Kaduna United FC. Aneke joined Kaduna United FC in January 2010 and made his debut in the Nigeria Premier League during the same month. I believe Aneke played approximately 25 matches during the Nigeria Premier League 2009-2010. 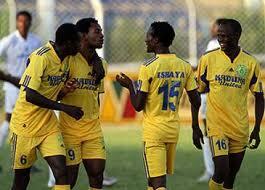 At the time of writing, Kaduna United FC has played 29 matches in the Nigeria Premier League 2010-2011. I believe Aneke has played approximately 25 matches so far this season (he lost a couple of matches in January 2011 due to a fracture on one of his toes). Based on the above, my estimate is that Aneke has played maximum 50 matches in the Nigeria Premier League. It is a fact that he has scored 21 league goals during these matches. The goal ratio is quite extraordinary by Nigerian standards and Aneke, who so far has been ignored by both the Nigeria B national football team and the Nigeria U-23 national football team, deserves attention. During the current campaign, Aneke made his debut in the CAF Confederation Cup 2011. On 12.06.2011, Aneke scored two goals when Kaduna United FC knocked out ES Setif of Algeria from the tournament. It is rather difficult to track the career of Aneke before he joined Kaduna United FC. Apparently, he started playing football at an amateur club called Young Planners FC, apparently from Enugu. He then switched to Ebonyi Angels FC, based in the city of Onitsha in southeastern Nigeria. Ebonyi Angels FC was apparently sold to the Anambra state in March 2008 and the club were renamed Anambra United FC. As far as I know, Aneke also played some matches for Anambra United FC, most likely during the season 2009-2010, when Anambra United FC played at second level of Nigerian football, the so-called Division One. The date of birth of Aneke is yet to be confirmed but I personally think Aneke is the same player as the “Jude Aneke” presented in this profile: http://www.mybestplay.com/players/soccer-forward-judeaneke-37099ii3.html. I base this assumption on the fact that the “Jude Aneke” presented in the profile, is described as a hardworking, determined striker with good finishes, that the name “Jude Aneke” is rather uncommon, that the picture in the profile looks quite similar to pictures of Aneke in the shirt of Kaduna United FC, and that the home town of the profiled player is Enugu, the same city where Jude Aneke of Kaduna United FC started his football career. I am therefore assuming that the correct date of birth of Aneke is 07.01.1989, which implies that he is 22 years old. However, according to this article, http://allafrica.com/stories/201012090636.html, Aneke was 20 years old in December 2010, suggesting he is born 1990 and not in 1989. In any case, Aneke should obviously be considered for the Nigeria U-23 national football team. It is my impression that Jude Aneke is a rather complete striker, able to score easy tap-in goals, to create changes on his own, to score through headers and to provide clinical finishes from almost any angel. According to the profile from Mybestplay, Aneke is 184 centimeters. Aneke is currently forming a very potent partnership with Yusuf Siman, another exciting prospect at Kaduna United FC. The pair has together scored 16 league goals so far during the Nigeria Premier League 2010-2011. Later this month, Kaduna United FC will participate in the group stage of the CAF Confederation Cup 2011, competing against top clubs ASEC Mimosas, Club Africain and Inter Luanda. Aneke will have his chance to shine and the name of Jude Aneke will probably be written on several notepads during these matches. Aneke is sometimes referred to as “Jude Anieke”. The picture shows a couple players of Kaduna United FC and I am pretty sure that Aneke is the player with the number 9 on his shorts.